Tendons, nerves, muscles and bones have to squeeze together in the narrow joint known as your wrists. When you hurt your wrist, you can get a wrist cortisone injection to ease your pain and stop the swelling. A cortisone wrist injection delivers steroids and a local anesthetic right where it’s needed. Ask your sports injury and pain doctor in New York City for an injection in the wrist for fast relief. It works up to three months, and the cortisone injection in wrist side effects are minimal. Make an appointment today in our pain management clinic to get your pain evaluation and treatment. Meet our pain doctor Febin, he is the best rated sports pain management specialist in NYC. Your wrist is a delicate yet vital joint, the smallest of your body. As a consequence, it’s easy to injure your wrist in a fall or from overuse. Soccer may be the only sport for which you don’t need your wrist; all other sports potentially put your wrists in harm’s way. When illness or an injury occurs, however, you can get pain relief from a cortisone wrist injection. Usually, your NYC physician recommends more conservative treatments — everything from pain medications to physical therapy — before turning to a cortisone wrist injection. Sometimes, those treatments are enough to ease the pain and heal the problem. But when a wrist cortisone injection is the best alternative, you’re in good hands at the Sports and Pain Institute in NY. Your sports and pain medicine doctor in Manhattan determines exactly where your pain originates and where to place the injection in the wrist. Your wrist is cleaned, disinfected. Your wrist is set on a comfortable level for your doctor and for you, with the injection spot on the top. For complex cortisone wrist injections, your wrist and hand are placed on an x-ray table so your physician can use real-time fluoroscopic imagery to guide the needle where it needs to go. Once you’re comfortable, the doctor uses a topical anesthetic to numb the area before the injection. Your sports and pain doctor makes the injection, placing the steroid medication at the right spot to encourage pain relief and healing. The local anesthetic in the injection provides instant pain relief, but it wears off in several hours. Your pain may return then, because the steroids don’t start working until two or three days after the injection. In the meantime, over-the-counter pain relievers are usually effective at controlling your pain. If you’re given too much cortisone in your joints, it can eat away at the cartilage there, which can emphasize any arthritis you already have. Therefore, your doctor limits your exposure. You can’t get a cortisone wrist injection more frequently than every six weeks, and your physician should limit the number of injections you get to fewer than four per year which includes all steroid injections, including the cervical epidural and lumbar epidural steroid injections. 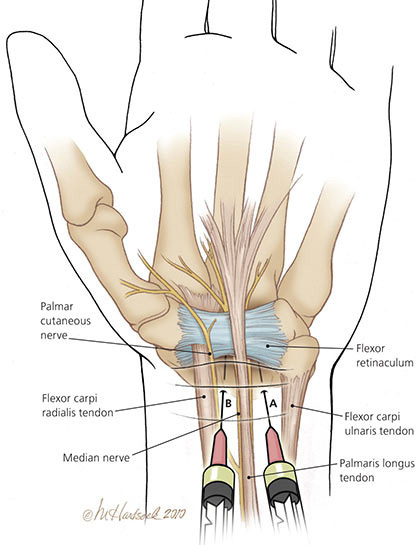 Do you have any questions about the wrist injection for wrist pain we offer in NYC? Would you like to schedule an appointment with the best rated wrist pain management doctor Febin Melepura MD of sports injury clinic in New York? Please contact our office for consultation with the pain relief specialist in Midtown Manhattan.